The JTX Sprint 3 is a motorised folding treadmill that offers a wide range of speed adjustments and workout programmes. No matter your age or fitness level, this is a treadmill that will provide you with a great workout. Let’s take a closer look at the machine’s features and see how well it performs. The JTX Sprint 3 treadmill is a great workout tool for people of all fitness levels. Even if this is your first time using a treadmill, you’ll find that the Sprint 3 is very easy to use, and offers a wide range of speeds to meet your experience and comfort level. Most treadmills offer a minimum speed of 1km/h, but this treadmill’s minimum speed is just 0.8km/h. This is ideal for anyone recovering from an injury or those who are at a lower fitness level. The maximum speed of 14km/h allows you to continue adjusting your speed as you progress. For interval training and weight loss, the treadmill’s adjustable speed settings are great. The Sprint 3 offers 16 incline levels over 8 degrees and 48 different workout programmes. The digital display allows you to track your progress by monitoring your heart rate, time, speed and distance. The speed and the incline controls are both located on the treadmill’s handlebars for easy access during your workout. You’ll also find instant incline and speed controls on the console next to the digital display. The multitude of programme options allows you to vary your workouts, while the digital keeps track of your progress and keeps you motivated. Speaking of staying motivated, the Sprint 3 also comes with built-in speakers, so you can listen to your favorite workout music during your treadmill sessions. 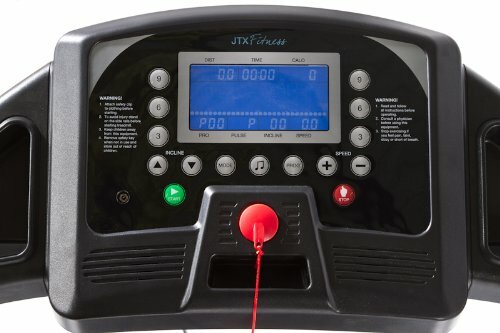 An MP3/iPhone input is also included, so you can hook up your device right to the treadmill. The machine itself is constructed with top grade steel and arrives 99% assembled. Two-man delivery is offered to the room of your choice, so setting up your treadmill is simple and easy. Once you’re done using the treadmill, the assisted fold up functionality allows you to fold your treadmill away and store it in the corner of a room or in the closet. A variety of workout programmes keep your workouts fresh and exciting. LCD display monitors important stats, such as heart rate, calories burned, distance and speed. Built-in speakers with input for an MP3 player or mobile device. Multiple incline levels for challenging workouts. Low minimum speed allows you to start off slowly and work your way up to a higher speed. Comes with a one year, in-house service warranty. Much like other reasonable build quality treadmills, the JTX Sprint 3 is heavy. Although the treadmill is heavy, JTX offers free, two-man delivery to any room in your home. The treadmill comes 99% assembled, so it takes less than an hour to get the machine up and running. 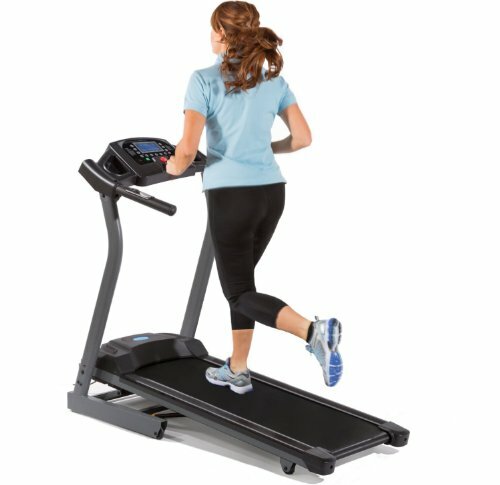 The JTX Sprint 3 is a great treadmill for anyone. No matter your age or fitness level, the Sprint 3 has a workout programme for you. The controls are easy to use, the machine comes mostly assembled and the built-in speakers allow you to enjoy your favorite workout music without headphones. If you’re looking for a treadmill that’s versatile and easy to use, the Sprint 3 is the right choice.